Synchondroses are the cartilaginous joints of the skull which form when neighboring centers of ossification within a continuous mass of hyaline cartilage enlarge and encroach upon each other. This intervening cartilage functions as a proliferative growth spacer during bone development and is typically replaced by the developing bone. In the skull the synchondroses form between the occipital, temporal, sphenoid, and ethmoid bones of the developing chondrocranium, and provide early support for the developing brain. While synchondroses closely resemble the epiphyseal growth plates of long bones, they contain a proliferating and hypertrophic chondrocyte zone at each end, with a resting zone in the middle. 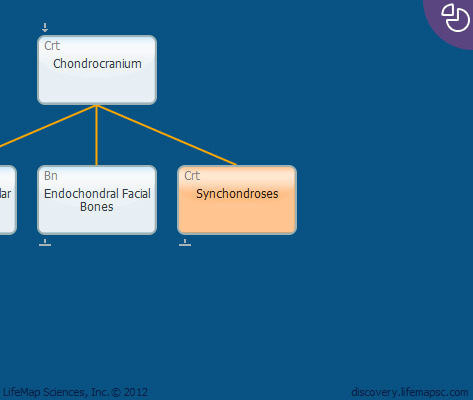 These synchondroses constitute important postnatal longitudinal growth centers of the cranial base. In the mouse, there are two synchondroses in the midline cranial base: the spheno-occipital (SOS) and presphenoidal synchondroses.